It’s interesting how something perceived in one part of the world as ugly is seen as having great beauty somewhere else. 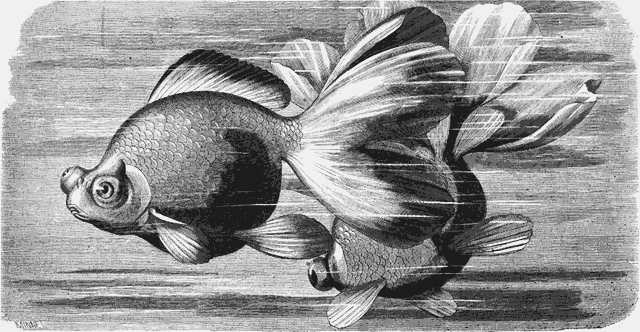 This vintage fancy goldfish drawing is of a pair of fish that one Frenchman, writing for L’Illustration in 1873 describes what the French are calling telescope fish. The frontal eyes are on a “pronounced projection” which is where the name comes from. He further explains that the fish is a species created by the Chinese and is not an improvement on the work of the Creator. Our family give these fancy goldfish a more humorous name – googly-eyed goldfish. These poor creatures seem so mis-shapen that they seem to wobble through the water rather than swim. But, their large, fanned tails and bright colors are quite stunning – at least to this American of the 21st century. This drawing was not credited, as was typical of this magazine, but there might be a teeny signature in the bottom left-hand corner. This public domain fish drawing is of two fish and they are positioned in such a way that you could isolate one of them, if you so desired.